Are you ready to face the surge of the deep sea with hundreds of Hungry Sharks? 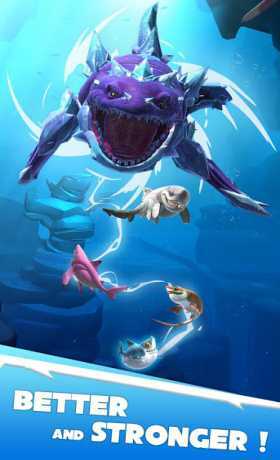 Assemble the best squads of sharks to battle your opponents and build a dream underwater world! In this sequel to Hungry Shark, you will experience brand new adventures. Set in the mysterious deep ocean, you can create a dream reef where your unique sharks can breed and evolve. Choose your best ones to join in fast-paced, real-time PvP battles with quick-witted strategy. Get ready to explore worldwide ocean territories and unlock rare, powerful sharks! 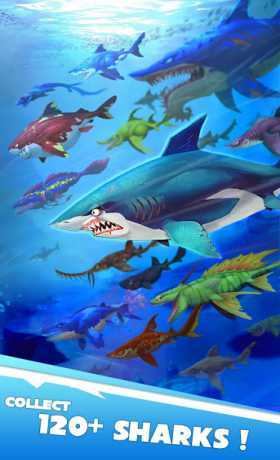 COLLECT 120+ SHARKS: The adorable Swell Shark, the clever Longnose Sawshark, the chubby Bluntnose Sixgill, the prehistoric Megalodon, the ferocious Cretoxyrhina, and many more! Discover tons of fascinating sharks and add them to your collection! 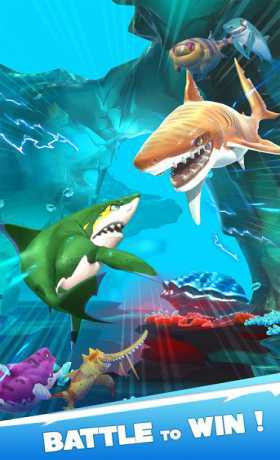 BATTLE TO WIN: Team your sharks up and take part in epic battles against other players! Select the perfect combinations, use special Shark-Fu, choose the right fight timing…Develop your strategies to claim victory! BREED UNIQUE SHARKS: Help your sharks fall in love and…witness the birth of new sharks! Mate sharks from your own collection, or borrow from your friends! Hundreds of pairings, hundreds of possibilities! GUIDE THEM TO GREATNESS: You are now your baby sharks’ mentor! Prepare them a good meal, and accompany them to a training class. With your wise guidance, evolve your baby sharks into the ultimate rulers of the ocean! BUILD A DREAM REEF: Customize your reef your way and build the perfect home for your sharks. Watch the light shift from day to night surrounded by the beauty you created. BATTLE AROUND THE WORLD: 15 different arenas await! From the Mayan Monument to the Ice Cave to the Atlantean Temple, make your way through new challenges as you defeat your rivals and unlock rare shark recipes! GET SOCIAL: Join a clan and meet shark lovers from all over the world! Add more friends, share your experiences, and team up to breed new sharks. You can even donate food to each other and get awesome rewards! ENTER LIVE EVENTS: Various map events, Ghost Pirate Ship, 3-Star Tease Battle…… They all allow your sharks to go on the boldest adventure across the oceans. All sorts of daily events with awesome rewards will leave you hungry for more! Play Hungry Shark Heroes and hundreds of sharks are waiting for you!